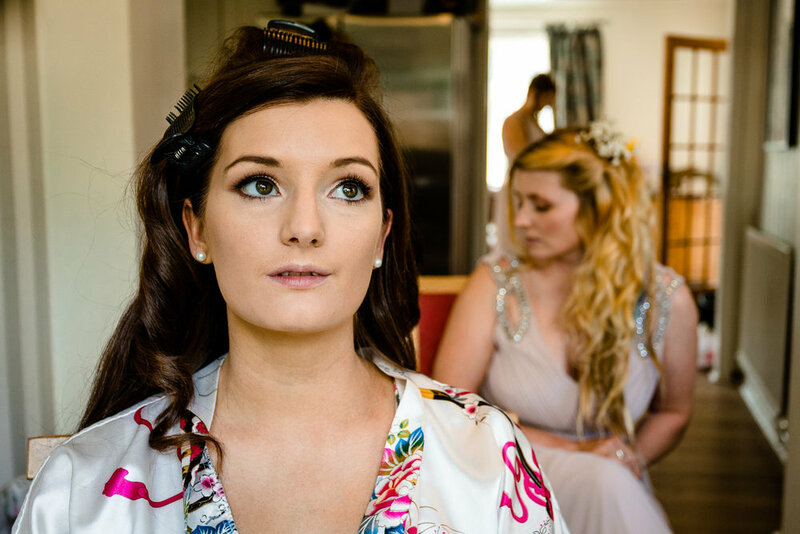 We are beyond excited to share with you Kirsty & Kirk’s preview of their wedding at Victoria Baths on Saturday. We have been looking forward to photographing this one for a long time, as it is where we got married three years ago! This stunning building was built in 1906 but was closed to the public in 1993 and fell into disrepair. 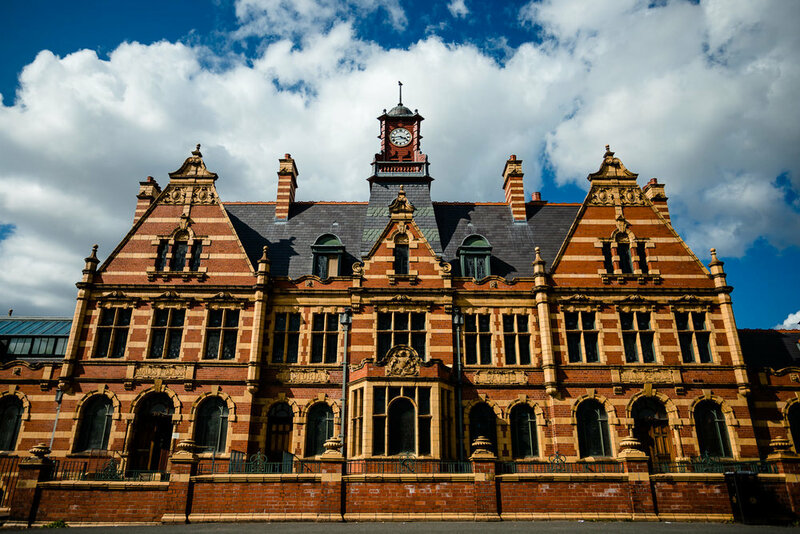 Luckily thanks to the campaigning of the amazing Friends of Victoria Baths and BBC's Restoration program, it was saved from being demolished in 2003. 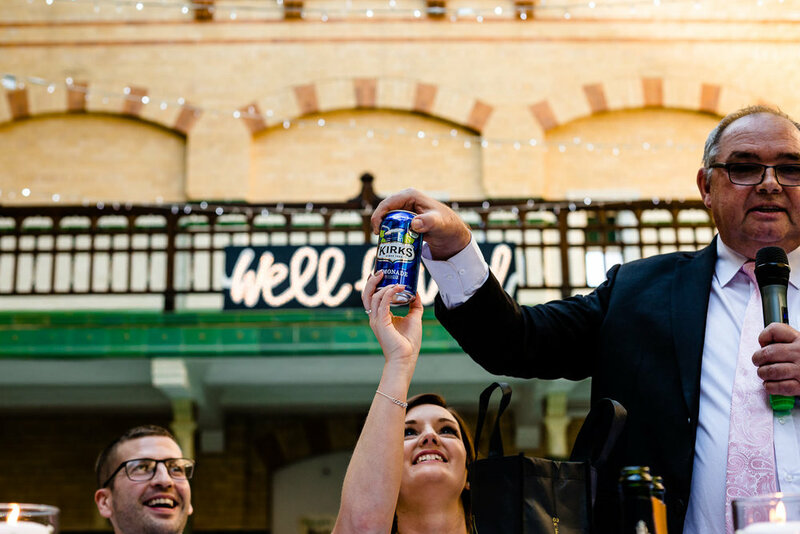 They have been raising money for the continuing restorations since through open days and hiring out the venue for events and even TV shows (anyone else a Peaky Blinders fan like us?!) They hope to restore the main pool to reopen it for public swimming once again and earlier this year filled it for a one off fundraising swim. We jumped at the chance to swim in the same spot that we got married and we even bumped into Kirsty & Kirk having a swim there too! We cannot express how much both ourselves and Kirsty & Kirk love this building. 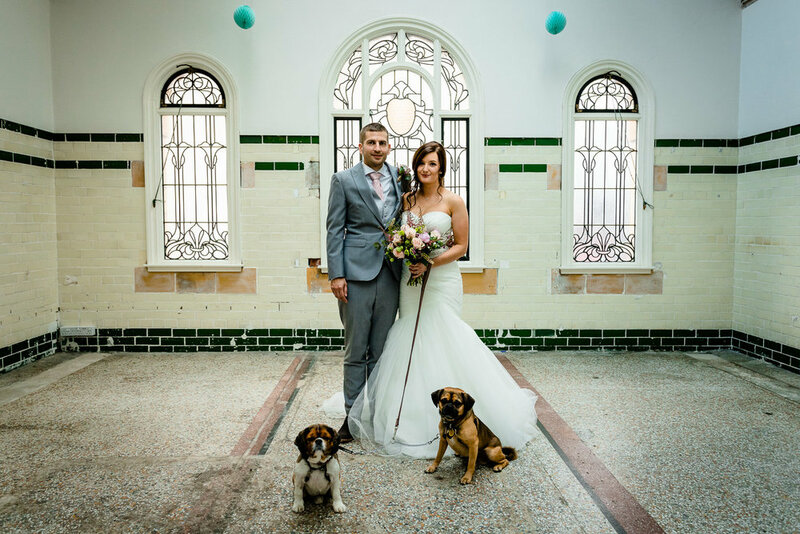 From the stunning space of Gala pool to the beautiful stained glass windows and gorgeous green tiles. You can’t help but fall in love with the buildings character and charm so as you can imagine we were spoilt for ideas for photos. The light inside the Gala pool for their ceremony was stunning, Kirsty & Kirk marrying in the deep end (obviously without the water!) 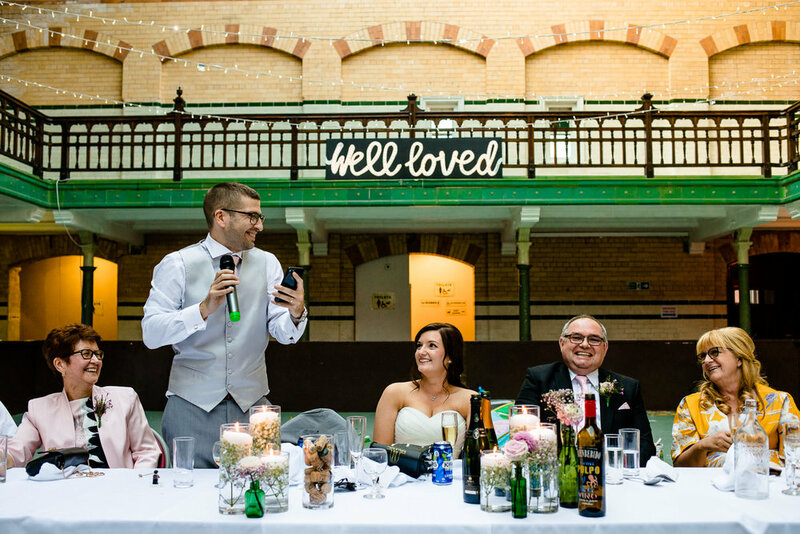 The central pool is covered over in a dance floor which makes for an amazing party space, overlooked by their now iconic “Well Loved” light up sign. Kirsty & Kirk filled the third pool with fun games and inflatables for their guests to enjoy throughout the day. 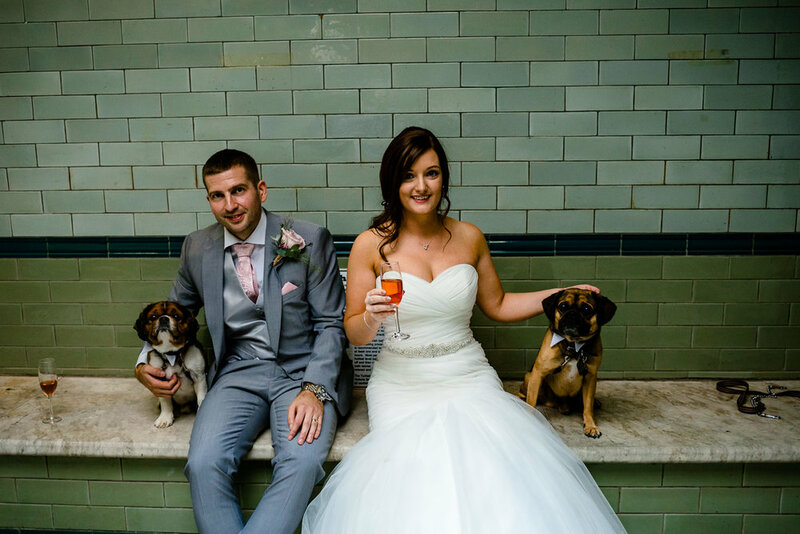 They even bought along their two adorable dogs Hugo and Ralph which we loved, can we have more dogs at weddings please! 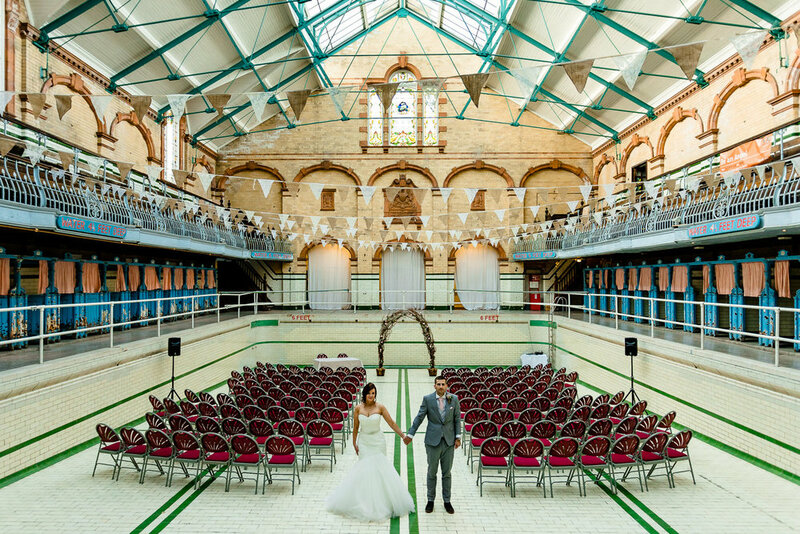 Victoria Baths is a venue very close to our hearts and we were so honoured when Kirsty and Kirk chose us to capture their amazing day. We hope you love these previews as much as we did photographing them.